As this article from the Ahwatukee Foothills News notes at the end, we still do not have this proposed project’s Environmental Impact Statement (EIS) from the Arizona Department of Transportation (ADOT), which our community has been waiting on for over twenty years. Back when this project was much smaller and was called State Route 218, ADOT released an environmental assessment for the project in January 1987. The size of the project grew as the city of Phoenix grew, and we have been waiting since 1987 for ADOT to update their findings on the impacts of this proposed project. Perhaps one reason why ADOT has stalled on the EIS for over twenty years is that ADOT officials know this is a project whose time has come and gone. Sierra Club lists Loop 202 as one of worst transportation projects in U.S. The Sierra Club has listed the Loop 202 Freeway extension as one of the worst transportation projects in the U.S. in 2012. The South Mountain Freeway Project is listed in the Sierra Club’s new national report, “Smart Choices, Less Traffic: 50 Best and Worst Transportation Projects in the United States.” The report assigns a Best and Worst project to each state. Projects included in the report were chosen through a nominations process and were reviewed and selected by report authors and a review committee. Projects were reviewed based on oil use impact, environmental impact, health impact, economic impact and land use impact. “The best projects provide transportation choices that allow Americans to reduce oil use and meet their mobility needs without driving, while the worst projects reinforce an expensive and polluting dependence on oil,” the report said. The South Mountain Freeway, as currently proposed, was condemned for cutting through South Mountain Park, sacred sites, and critical wildlife corridors. The report also said the Loop 202 extension would encourage long commutes and exacerbate urban sprawl. The best project listed for Arizona is the Sunlink, a 4-mile electric streetcar system that will link the University Medical Center, the University of Arizona, Downtown, Rio Nuevo and Congress Street in Tucson. The Sierra Club released a similar report in 2002. Of the 20 best projects listed in 2002, 80 percent have either been completed or are currently under construction. Of the 26 worst projects listed, five have been completed and seven are currently under construction. The Arizona Department of Transportation has not yet released a Draft Environmental Impact Study for the South Mountain Freeway. For more information on the project, visit http://www.southmountainfreeway.com. The primary reason why this action was called was to show everyone that our Himthag, our culture, has a major place in the decision as to whether or not this freeway should be placed on tribal land. It has also been reported that the supporters of the freeway are making statements that “our culture is dead” and we felt the need to show them how strong our teachings are. Many of us continue to practice our teachings, which center on respect and being caretakers of our lands, all O’othham lands, and not just the lands of the Gila River Indian Community’s current boundaries. In our teachings, and I can only speak about the male side of our culture, we O’othham men are born with the obligation that we must place ourselves in between anything negative or threatening in order to ensure respect and protection of our children, our companions, our families and relatives, our villages, our Hemajkam ( tribal nation), and also our lands. With this, we men must increase our numbers and the numbers of O’othham willing to retake their obligation to be protectors and caretakers of what is ours. When someone inside or outside the community threatens us, we must place ourselves in a position to protect And this is where we are now, that our people are tired of being disrespected by having to vote “no freeway” over and over again, which implies we are incapable of making our own choices; this is the mindset of those that embrace what we call Pi Vehsig chukthathag, or imbalance mind and thoughts. This affects both non-tribal as well as tribal minds. In our teachings, we know that we have inherited this land from our ancestors, our Sho’oshon, those who are our beginning. They have sacrificed much to give us this opportunity to show respect to our lands. This is another obligation we are born with; to think about everyone rather than ourselves. Sadly, our traditional ideals and teachings are being shunned and ridiculed when incitements and bribes are waved in our faces. Currently that bribe is the money in exchange for our land to build the freeway. This is the reality of our O’othham world that we believe we are having a harder time finding balance, or Vehsig. This is untrue, it is very easy to create balance, we just choose not to. In this particular circumstance, which simply is the taking of more of our land for the benefit of others, the supporters of the freeway are not unique in their mindset or the position they feel they hold. In our tribal history (and the history of all native peoples all over the world), we see examples of Pi Vehsig thinking – in english it is called colonization. We have an oppressor – in this case Pangea, and we have the oppressed – in this case the landowners.In the description of Pi Vehsig and how it has impacted Akimel O’othham lands, the Fifth Mashad, or moon, is called “Bishak Mashad: the ‘Surrounds, Embraces, and Takes Over’ phase. In this moon, the colonizer (Pangea) will use fellow O’othham (landowners) and our teachings (that Moahdahk is sacred) to claim what is ours (our land). More to this point is that the oppressed are manipulated to think that they must embrace non-tribal thinking, while also being told that this non-tribal philosophy is for the benefit of the tribe. It’s a contradiction that is very difficult for the oppressed to not only see, but for them admit. At this point in our colonization, the oppressed, which is fellow O’othham (i.e. Joey Perez and the landowners) become addicted to the imbalanced way of thinking, which is so far from our traditional teachings, that they display what we call Vechij Pi Vehsig, the New Imbalanced Thinking; the closest term in O’othham was can describe as sub-oppression. This is the point in our tribal history where we no longer need an outside oppressor to threaten the community’s future; we begin to do it on our own. It becomes our own relatives who try to destroy the balance. The supporters of the freeway cannot see this because they are living it. They will turn their rage on you and threaten you because you can see it; sadly we are watching them being manipulated, oppressed, ridiculed, and leashed from a distance, and many times there’s nothing we can do about it. There are times when you just have to give up on a person, because there are others that really want and embrace your help. The supporters of the freeway can claim they are protecting Moahdahk, but they are not willing to give up what they think is their “family land,” which is not an O’othham philosophy; that one person can own land that belongs to all of us. The land belongs to all of the O’othham regardless of whose name the federal government placed on it. In the way of our Himthag, it is all of our responsibility to protect this land. Not disrespects it. The landowners justify their existence through a law that was established to steal tribal lands. The Dawes Act (also known as the Allotment Act) was created in order for the Americans to take tribal lands away from tribal peoples, thus the reason why there are no reservations on the eastern part of this country. Under this law, the federal government through the Department of Interior legally owns all land, including allotted lands. Therefore, the term “land owner” is a fallacy. More importantly, under traditional O’othham Himthag laws and teachings, all of us own and take care of our lands. The so-called landowners only have to relinquish their allotments to the tribe should they truly have the best interests of the whole community in mind; instead, they want to believe the pieces of land are theirs, and they will get some money for it, and somehow this benefits all of us. This is what greed does, this is what pi vehsig thinking does. We always have to consider our actions and the responses others will have towards our actions. 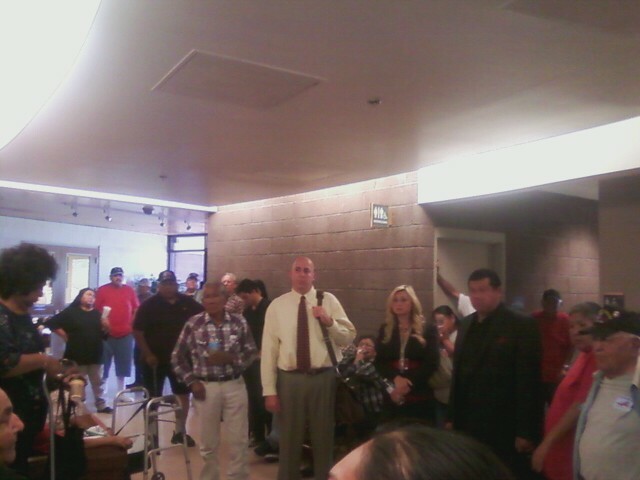 This sacrifice and stand to show our opposition to the freeway was open to everyone because it will affect everyone. In understanding that all peoples have been oppressed at one time or another, and have faced ridicule and others telling them they are incapable of making their own decisions, this activity allowed them to help a group of people change that negative way of thinking. We had many groups of people invited and participate, all ages, all philosophies, because this taking of our land is something they did not like to see happen to them and they would not like to see it happen to us. Go’ol Hemajkam (The Other People) were invited, cared for, fed, provided warmth of the fire and handshakes, because they care for us so much to come and help us stop this disrespect. They were invited because we wanted them to see what we can do, and perhaps they will be strengthened to protect their own. It was made very clear that this run and march was specifically for us to show how our Himthag is important in protecting and keeping our lands; there was no hidden agenda. This activity was all volunteer and relied upon individuals and families to support it; we did not need to charter vehicles or ask anyone to sign papers; they just showed up and carried prayers across our lands willingly. People need to know the true reasons why this land must remain in our possession as a community, and our new friends will help spread that to the rest of the world. Gila River Indian Community, AZ- On December 7th and 8th, members of the Gila River Indian Community (GRIC) showed their opposition to the proposed 202 freeway by holding the Sacrificing Against the Freeway gathering, a two day spiritual relay run and march. Participants of all ages and communities came to support No Build GRIC advocates by offering their prayers and strength to efforts against the proposed South Mountain Loop 202 freeway. No Build supporters from the Tohono O’odham Nation, Onk Akimel O’odham (Salt River), Dine (Navajo), Pee Posh (Maricopa), Apache, and Hopi tribes also helped run and carry prayers throughout the two days. The first day started with a 36 mile sunrise run from U’us Kehk (Blackwater) through Hashan Kehk, Gu’u Ki (Sacaton), and Vah-ki, and ended at the southern base of the Estrella Mountains. The second day was a 15 mile sunrise run and march. The march went along the proposed route of the 202 extension in Komadk. Marchers carried banners stating “Pangea Will Never Represent My Land Interest”, “Caution Loop 202 Biohazard”, and “Pangea Is Bad Business for Ahwatukee and Gila River”. The gathering ended near the base of Moahdahk Do’ag (South Mountain), where runners ran staffs to the mountain. Throughout the two days, organizers stressed the importance of coming together through culture, and encouraged community members, especially the youth, to mobilize against the freeway. Since 1983, the Arizona Department of Transportation (ADOT) has threatened the health, environmental quality and culture of the Gila River Indian Community by attempting to build the Loop 202 South Mountain freeway extension. For over 25 years, GRIC has continuously voiced its opposition to the Loop 202 extension. In February 2012, the community voted 720 to 603 in favor of a No Build ballot option in a single-issue vote on the 202. Still, ADOT, the Maricopa Association of Governments (MAG), and pro-freeway supporters like Pangea, a land development corporation, continue with their plans centered on the construction of the freeway extension. Additionally, ADOT has delayed the release of the environmental impact study (EIS) for this proposed construction for over 25 years. Currently, Pangea is seeking a Memorandum of Understanding (MOU) from GRIC tribal council which grants Pangea and their investors exclusive rights to develop over 5500 acres of tribal land on the reservation’s western end along the route of the proposed Loop 202 freeway. Gila River landowners have been targeted by the Pangea corporation with ‘good-faith’ payments of $50 for their consent signatures and have been bribed to attend tribal government meetings with $500 raffle prizes. The cash payments and raffle prizes are used by Pangea in addition to a misinformation campaign that downplays the negative health impacts of the freeway, and which makes no mention of the destruction of traditional cultural properties that are in the path of the freeway and the Pangea City Concept. Organizers of the Sacrificing Against the Freeway sought to inform community members and Gila River tribal leaders that No Build is an option and to remind them of their duty to protect O’odham land. No Build GRIC advocates were thankful for the show of support, and encouraged No Build supporters from both GRIC and the Phoenix area to attend upcoming MAG public meetings in January 2013. Community members expressed their hopes for more gatherings like Sacrificing Against the Freeway. Siiki encouraged the need to address the harmful cultural impacts of the proposed freeway, as well as the environmental impacts. As part of our work to stop the use of O’odham resources to benefit the Phoenix area, we ran a half page advertisement in the December edition of the Gila River Indian News (GRIN). This is just part of our outreach in Gila River. In our community, we have also distributed zines at parades, held a benefit concert to raise awareness of the NO BUILD option, and we recently participated in a two-day prayer run & march against the freeway. The feedback from our people has been very positive about the information in our ad. The advertisement now needs to be paid off. Unlike Pangea, the corporation that wants to build a freeway and 6000 acre city in Gila River, we do not have outside investors and money to burn. We are a group of O’odham with children, jobs, and school to take care of. We are asking for your donations to help us pay for the ad in the December GRIN. We need to raise $235 by December 28th to pay for the ad. If you can help us, please do. Please help protect O’odham land. Ahwtaukee, AZ- On Friday, December 7, a group of 17 people from the Gila River Indian Community (GRIC) and from the Phoenix area held an anti Loop 202/anti-Pangea rally at the Ahwatukee Foothills Chamber of Commerce Public Policy meeting. Pangea was in attendance to present its “City Concept” which centers on developing almost 6000 acres of Gila River land south of Pecos Road. Protesters came to challenge the merit of the plan due to lack of transparency from Pangea, as well as to counter their misleading campaign that Pangea will save South Mountain, and that their massive city would bring economic and cultural prosperity to all GRIC members. The group held banners that read “Pangea is Bad Business for Ahwatukee and Gila River” and “Stop Pangea, Save Our Future”. The banners spoke to Pangea’s failure to meet any of the terms of an 11-point legal review of its land use plan, which was delivered to Pangea by the Gila River tribal council on October 17, 2012. Protesters distributed copies of the tribal council’s official motion to members of the Chamber of Commerce, to inform Ahwatukee residents of the public health threats that Pangea’s city would usher in, and that No Build is an option. Youth marching down Chandler Blvd. “I was really happy to see youth from the community come out to the city for this demonstration against Pangea and the Loop 202. But I was really happy that the Protecting Arizona’s Resources and Children (PARC) were also in attendance speaking out against Pangea and the 202 with us” said Justin Webb from Gila River, Goodyear Village. “I think PARC opposition will encourage community members to take a stand against the Loop 202, and their similar perspective is good for the community to see”. Despite the concerns expressed by both communities, Pangea’s spokesman Joey Perez presented their City Concept plan, and cited repeatedly that No Build was not an option. Perez explained that no one has any say in the transportation corridors required by the North American Free Trade Agreement (NAFTA), namely the CANAMEX Corridor which would run from Mexico, up through Arizona all the way to Alberta, Canada. “I am outraged to hear Pangea cite NAFTA and CANAMEX as their justification that the freeway is going to happen. I feel my future and children’s future is endangered by such plans, especially since our community is against the level of development the Loop 202 would bring,” said Andrew Pedro from Sacaton. “I encourage community members and tribal leaders to look into CANAMEX and NAFTA, so we can be informed of the ramifications these projects represent, so we can fight it”. The Gila River Indian Community voted on the No Build option for the freeway in February 2012. However, Pangea, regional transportation planners, and the Arizona Department of Transportation continue to threaten the public health, environment and cultural heritage of Gila River. Protesters from Gila River came to Ahwatukee to represent the No Build voice of their community, and called upon tribal leadership to publicly stand with them. Gila River leaders have not yet publicly advocated for No Build. Overall protesters were pleased to meet and share info with members of the chamber, and look forward to working together against the Loop 202. Ana Morago, one of the many youth from Gila River said “It was good to see people from Ahwatukee on our side, and that together we made an impact showing that the O’odham choice was No Build”. Santan, AZ- Gila River Indian Community (GRIC) members enjoyed a night of music, information and resistance against the Loop 202 freeway on December 1st, where a No Build awareness concert was held at the Santan ballfield. Musicians from Gila River, Salt River, Tohono O’odham Nation, Navajo Nation, and Phoenix came together to support GRIC members organizing against the freeway. Speakers at the concert who oppose the freeway advocated for the Pangea corporation, the Maricopa Association of Governments (MAG) and the Arizona Department of Transportation (ADOT) to respect last February’s community-wide No Build victory in a vote about the proposed freeway. Throughout the concert, the sounds of ska, hip hop and punk were performed to a crowd of over 60 people. The show featured Alex Soto of Shining Soul (Phoenix/Tohono O’odham), MC Optimal (Salt River), Lo Cash Ninjas (Navajo Nation), Criss Cross Salad Toss (Phoenix), Travis James (Phoenix) and finished with the sounds of Gila River’s own Requiem. Despite the event’s focus towards the Gila River youth, elders and community members of all ages were in attendance, along with tribal members from nearby Salt River Pima-Maricopa Indian Community and the Tohono O’odham Nation. No Build shirts were available for a suggested donation throughout the event, with all funds going towards future No Build organizing efforts. “The main objective of the show was to bring awareness to the community about the freeway. The older generation is more aware of it, but youth in Gila River have little to no idea of what is going on. In a sense, the concert was about getting youth to learn about issues in their community,” said Andrew Pedro from Sacaton. Pedro is the drummer for the band Requiem, and is one of the youth who organized the benefit. 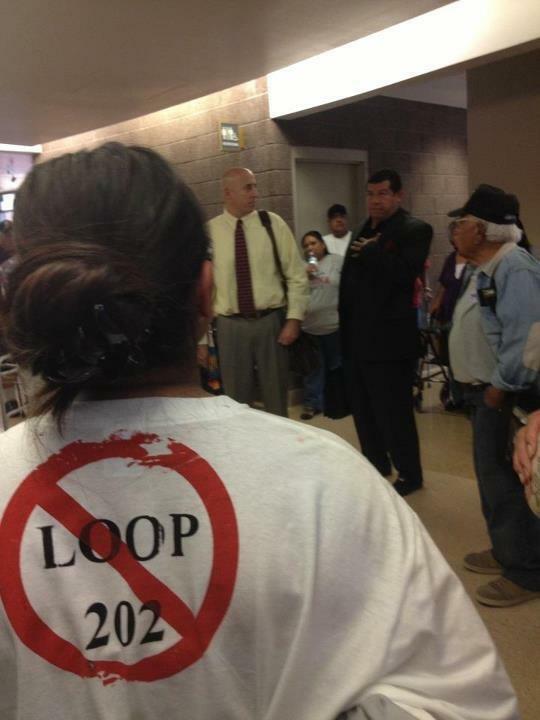 Also in attendance were many non-O’odham supporters who oppose the Loop 202. The No South Mountain Freeway group from Phoenix set up an information booth with pamphlets against the freeway. In addition to the many negative impacts expressed by GRIC members, non-O’odham No Build supporters also oppose the urban sprawl of Phoenix upon GRIC lands, as well as unsustainable regional growth. The Sun Corridor was one example given of that, which is a transportation and trade route centered on a “megacity” covering the area between Phoenix and Tucson, with little or no input from the O’odham people whose land is in that area. The Sun Corridor is one part of the CANAMEX trade corridor, a massive superhighway spanning from Canada to Mexico. The CANAMEX Corridor is largely backed by transportation officials and politicians, while most of the public has not been informed of the environmental impacts of such a large construction project. These were some of the reasons why non-O’odham No Build supporters are against the the freeway. No Build organizers and community members expressed their gratitude to the youth who put on the awareness concert, and were happy to see young people take action against the 202. Sacaton, AZ- At the October 17, 2012 Gila River Indian Community (GRIC) Tribal Council session, Pangea, LLC and the Pecos Landowners Association (PLA) attempted to rush forward their plans pertaining to the construction of a city and freeway within the reservation. Pangea sought the tribal council’s approval for a Memorandum of Understanding (MOU) which granted Pangea and its investors exclusive rights to develop over 5500 acres of tribal land on the reservation’s western end along the route of the proposed Loop 202 freeway, which GRIC voted against last February. The PLA attempted to pressure tribal council to approve the Pangea corporation’s initiative for yet another community vote on the Loop 202. But to their surprise, Pangea and the PLA were confronted by young people wearing breathing masks and No Build 202 shirts who sought to hold both Pangea and the PLA accountable to last February’s Loop 202 vote. In that vote, GRIC voters voted in favor of the No Build option for the freeway. 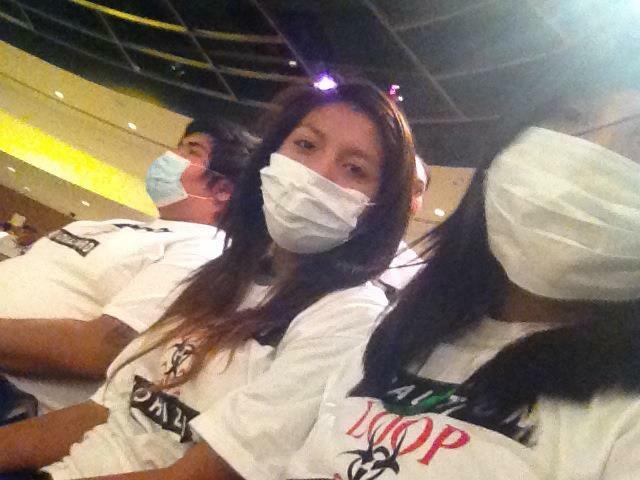 The Gila River youth, whose breathing masks symbolized the environmental toxins that freeways bring to the land and air, were at the tribal council meeting to demand that their elected officials uphold the No Build voice of the people. “I can’t vote yet, but if I could, I would have voted No Build too. The people who want the freeway should think about what my generation will go through if all we have to inherit is freeway pollution”said 14 year old Lily Miles, of Komatke and Vah-ki, who was one of the twelve who wore medical breathing masks and No Build shirts in solidarity with the community’s No Build voice. Since the historic Loop 202 vote, many GRIC members, especially the youth, have felt their tribal leadership has not fully upheld the community’s No Build stance. This suspicion is heightened since GRIC Governor Mendoza allowed Pangea to consult with GRIC’s Office of General Counsel for their City Concept and freeway plans. In addition, Governor Mendoza presented the PLA initiative that calls for another Loop 202 vote at the September 26th GRIC Legislative Standing Committee (LSC). If approved by the GRIC Tribal Council, the massive Pangea City Concept, the size of over 5000 football fields, would be the largest construction project in the history of the Bureau of Indian Affairs (BIA) and the Gila River Indian Community. The GRIC No Build supporters who attended the Wednesday council session were compelled to raise their voices against Pangea and the PLA in the tribal council chambers without saying one word. 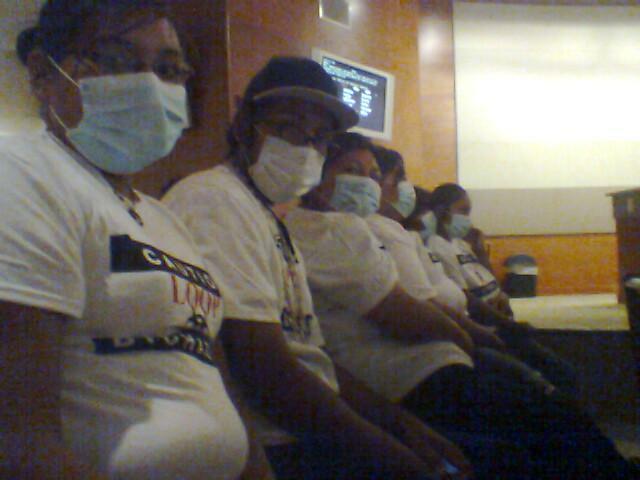 Their breathing masks and No Build 202 shirts, stating “Biohazard 202” spoke to the looming desecration of Muhadag Do’ag (South Mountain) and to the negative impacts the proposed freeway would bring to the environment and overall community health. 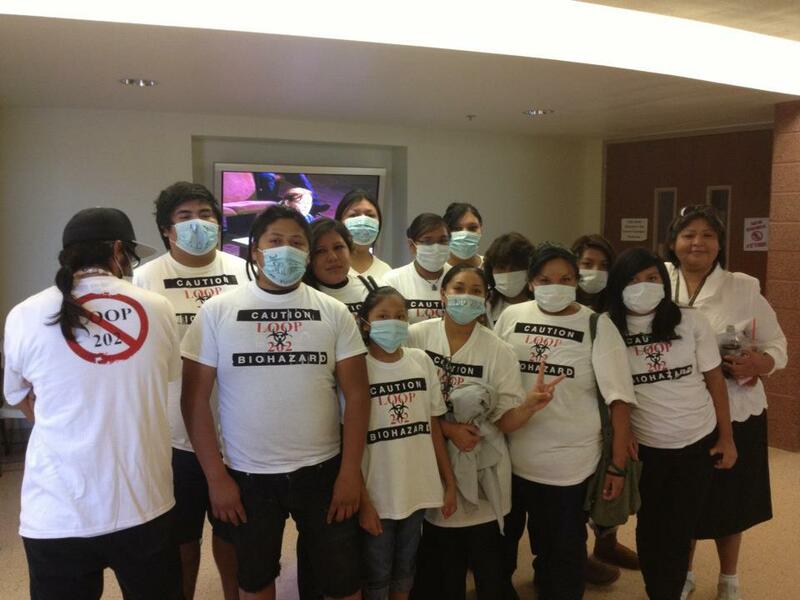 “Our tribal leaders must be held accountable for where their allegiances lie,” said Renee Jackson of Vah-ki, who was one of the No Build supporters who wore breathing masks and Biohazard 202 shirts during the meeting. “Our representatives must be transparent in where they stand on the issue of the freeway”. While council went to executive session to decide the merit of Pangea’s MOU and the PLA voting initiative, the twelve youth engaged pro-freeway Gila River landowners in the hallways outside council chambers. The youth shared their concerns regarding the environmental, health and cultural impacts the City Concept would bring to their future while council was in executive session and closed to the public. The mere presence of these twelve helped give a voice to the 720 GRIC members who voted for No Build, and their breathing masks showed the potential danger the freeway would bring. “I felt like it was my responsibility to be here and get informed about what is happening around me and in my community because I will be inheriting this land too.” said Karma Miles, 11 years old, from Komatke and Vah-ki. Despite the differences the youth had with fellow GRIC landowners, the youth presented themselves in a respectful matter, and even helped PLA elders by setting up chairs during executive session. After nearly an hour in executive session, Tribal Council decided that eleven key points needed to be met before any MOU regarding Pangea’s land use plans could be approved. The eleven points center around public safety, budgeting, jurisdiction, and land management issues that were not addressed within the MOU submitted by Pangea. Council clearly declared that all points must be met before Pangea’s MOU could be brought back before the council. Additionally, the misleading Save the Mountain initiative was held to standard GRIC Community Council Secretary’s Office (CCSO) procedure regarding signatures verification. The PLA submitted their Pangea-backed initiative to the GRIC Community Council Secretary’s Office (CCSO) on September 27 with the backing of 1,527 landowner signatures. Tribal council declared that each signature must be verified first before council would consider the initiative. As with the per capita initiative, a previous people’s initiative in Gila River, the signatures could take the CCSO four to six months to verify, especially with reports of missing tribal enrollment numbers with the signatures submitted, as reported by Community Council Secretary Linda Andrews at the council meeting. The Save the Mountain initiative, which Pangea and PLA deemed” first ever Peoples Initiative through the People’s rights under the GRIC Tribal Constitution”, does not save the mountain because it calls for the rejected freeway to be constructed on tribal lands along the foothills of Muhadag Do’ag (South Mountain). Despite the steps that are legally required to approve a voter initiative, a Pangea representative pressured council to move forward and approve the pro-freeway initiative. GRIC member Joey Perez of Pangea attempted to have council set a much shorter time frame for approval, by citing the 14th amendment of the GRIC constitution, which declares council has 60 days to make a decision on any initiative bought forth to them. The Pangea corporation’s interpretation, as stated by Perez, was that the 60 days started on September 27, when the signatures were submitted, which would force council to possibly reconsider another Loop 202 vote by the end of the year. But Perez, Pangea and the PLA were soon confronted with standard GRIC procedures regarding initiatives: signatures must be verified before the initiative can be considered by the council. The reason why the Pangea corporation and pro-build supporters disregard the No Build victory and are attempting to rush the tribal council to schedule another vote on the proposed freeway is because in 2013 federal land leasing regulations for tribal allotted lands become much more restrictive. Changes to Title 25 of the BIA’s Code of Federal Regulations will require 100 percent of landowner consents before the BIA will approve any new leases pertaining to the use of tribal allotted lands for businesses. This would make the Pangea City Concept, which is centered around the construction of the Loop 202, subject to heightened federal regulations. The decision by Council to hold Pangea and the PLA transparent and accountable to the process was a long overdue first step in reversing its nine months of inaction regarding the No Build vote. Pangea and the PLA were expecting to walk out of the tribal council meeting with another Loop 202 vote scheduled, and their land development plans to be unopposed. But Pangea and the PLA left the October tribal council session in defeat when confronted with the gaping holes of their fraudulent campaign to bulldoze over 5500 acres for a Pangea city, and by the faces of the young people whose future health depends on the preservation and protection of Muhadag Do’ag, and their lands. For the youth who attended this round of the bigger fight to completely stop the Loop 202, it showed that their involvement will be crucial for the future of the community, and that a new form of expression is needed so that their voices can be heard by the Pangea corporation, the PLA, as well as by the GRIC tribal council and Governor Mendoza. “We made an impact by representing all the No Build supporters who can’t be here, to go to these meetings and be heard,” said Ana Morago, 18 years old, of Stotonic. “We aren’t bused in, like the way Pangea brings in their people. And even though we didn’t speak, our actions and how we presented ourselves spoke louder”.